I’ve always been a fan of the 3-2-1 style workout. Whether it be 3 minutes of strength, 2 minutes of cardio, 1 minute of core or 3 minutes of cardio, 2 minutes of strength, 1 minute of core (like this workout)- or even just 3 strength exercises, 2 cardio moves and 1 core move, I think it’s a great format that will leave you feeling like you’ve had a total body workout. In the case of today’s workout, I went with the 3 minutes of strength, 2 minutes of cardio and 1 minute of core format. 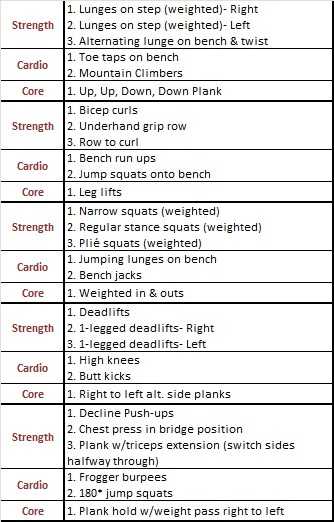 I tried to build off of the strength moves, especially with the leg sets. What I mean by that, is that I tried to do each minute of the strength set based off of the same move. Example: lunges- right leg, lunges- left leg, alternating lunges with a twist. I wanted a chance to make the muscles burn, but didn’t want to do 3 minutes of the same move because, well, that’s boring to me. Row to curl- I learned this from my friend Tim. It’s best to use a barbell here- perform an underhand grip row and when you’re in the contracted position (bar is up against your rib cage, elbows are back and reaching towards the ceiling), perform a curl, then extend to the contracted row position and back to the starting position. Repeat. It’s a small movement, but man it’s effective! Plank hold w/weight pass right left- in a high plank position, put a weight outside of your right hand then take your right hand, grab the weight and move it to the center. Then, take your left hand and grab the weight and move it to outside of your left hand (if it was on the ground). Repeat. The key here is to keep your hips down and weight spread evenly. The only thing moving should be your arms/hands. Let me know if you have further questions- I’m always happy to explain things in more detail! Questions for you: What’s your favorite workout format? Do you use the 3-2-1 format often? Also! I wanted to let you know about a really great workout that The Ultimate Bootcamp is hosting this Saturday from 9-10am. It’s $25, but all of the proceeds go towards The One Fund. Here are additional details, as well as a link for you to sign up if you’re around! Ultimate Bootcamp is hosting two fundraiser workouts in Boston & Framingham to support those running the 2014 Marathon and those that were affected by last year’s events. All of the proceeds from these workouts will be donated to The One Fund. The workouts, designed for beginner to intermediate fitness levels, will be a rewarding day of fun, heart-pumping outdoor bootcamp. For more information and to register, visit: www.ultimatebootcamp.com/onefund. PS I want to wish my friends Meredith and her twin, Kim, a very happy birthday! Oh – I love this – it looks awesome!!! And that plank move is on tap for this week – I’ve sort of been picking a theme every week lately for my daily moves and this week has been all about the planks!!! Thank, Kim! That’s a great move for your daily move. I think it’s fun that you’re doing it by “themes” lately!